I know a lot of guys who hit 35-45 years old, get some grey in the beard, and shave the whole thing off. After 20-plus years with a beard, that's a pretty big difference in grooming practices! Husband, Father, World Traveller, and passionate about liberty and helping men become more successful. Many of these men shocked their wives and children by shaving it off as soon as the grey hairs started taking over. For me, it was my dad's mustache. For my wife, it was her dad's full beard. In both cases, the response was, "Who are you?" And then, "Oh, you look about 15 years younger." It's just a fact of life that many men, even those loyal to their beards for 20-plus years, do not wish to be prematurely aged by the elimination of pigment from their beard hairs. We are big on the importance of appearance and first impressions at Liberty Premium Grooming Co., and so I get it that some men believe they look and feel more youthful without a beard when they hit their late 30s or 40s. Before I go on, I do feel compelled to tell you that grey in the beard is not the end of the world, and that it can add a distinguished, powerful look when groomed properly. I think many men are turned off because their beard is looking a little tired as a whole, and the grey addition to that tired beard puts them over the edge. If you're not quite sure about shaving it off, attempt to upgrade your grooming game before you commit to the shaved face. However, if you've seen the grey and know you can't possibly go on, the least we can do is make sure you're making the transition with the least amount of discomfort. The moment of action has arrived. You're going to want to do this in a slow, civilized manner. 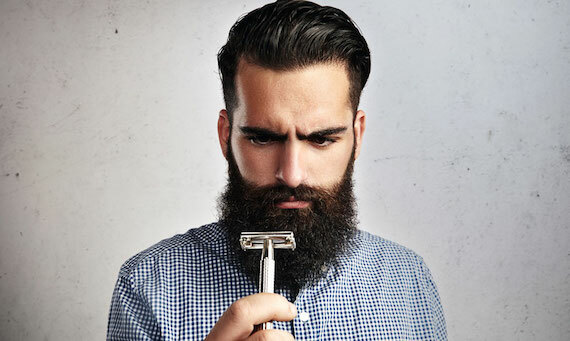 If your beard has any length to it, it's helpful to first use shears to remove the bulk of the beard. A secret benefit of doing things slowly and methodically with a nice pair of shears is that you can experiment with shorter, or different, styles. And perhaps you'll end up loving one of those styles. However, the main benefit is to reduce the load on your other tools, and to reduce the potential for pain. Once you've trimmed the bulk of your beard, grab your beard trimmer. With the shortest guard setting, trim the remaining beard down to stubble. Now you're a lot closer to a normal few days of beard growth, which means it's time to shave. It's time to trade in the beard trimmer, oil, balm, brush, comb, and mustache wax for the equivalent high-quality shaving instruments. You've got a choice here, but treat yourself to a meaningful shaving experience by going with something classic that forces you to pay attention and to take your time. My grandfather once told me that you can't rush a good cigar. It forces you to slow down. And in that time, what else are you to do, other than make the most of it by being present, enjoying life, and engaging in some introspection? Similarly, wet shaving forces you to slow down. So, choose a nice double edge razor to get you started. Naturally, your shave is only going to be as good as your blade. Don't cut corners here. The OneBlade, a $300 custom engineered razor, uses Feather blades. They spent many thousands of dollars researching and trying to create the perfect blade, yet decided simply to partner with Feather. Speaks volumes to the quality of the blade. Whether you use shaving cream or soap is a matter of personal preference. The differences are subtle, and both will do the job. Just make sure you take the time to get a nice lather. Soap is more firm and will take more effort to work into a lather. Soaps may have a wider range of scents, but they are typically less fragrant than creams. Cream will lather more quickly, and it provides a bit more protection or padding to your shave, although the differences are minimal. In order to lather up your shaving soap or cream, you'll need a brush. Choose a boar bristle or badger brush if you're looking for a high quality natural option. I prefer using natural products if the option exists. In fact, we chose boar hair for our beard brush. Here's something that will seem a little more natural to bearded men. The main types are balm and splash. Think about them like the difference between beard balm and beard oil. Balm is thicker and better for helping reduce irritation, while giving more moisturization. Splash is much like beard oil, which is more "watery", if you will. They're great for that crisp, clean feeling, and can help to protect the skin with antiseptic and or antibacterial properties. You know that proper beard grooming requires a routine -- often a daily one. In case you couldn't guess, the recommendation is to opt for wet shaving, instead of what society now calls "shaving". By that I mean using a 73 blade bit of plastic with some unsatisfying blue goo for lubrication. Wet shaving, as we've discussed already, requires a routine, and it requires you to slow down and be present. And here's a bonus -- you'll also get a much better shave. If you've had a beard for years, there is no way you want to be dragging a multi-blade cartridge razor against the newly-sensitive skin of your face. If you come at it with poor quality tools and a bad technique, you'll be cursing the razor burn and cuts that now adorn your beardless face. You might even start to wonder about growing that beard back. Youtube is the best resource to learn, as it's much easier to see than to read how to do it! Just as you likely used beard balms or oils in your beard to keep it healthy, strong, and shiny, it is essential to care for your skin, now that your beard has been laid to rest. You wanted to look younger and better, right? Don't neglect taking care of the skin on your face. The essentials are washing and moisturizing daily. Use a wash cloth or a cleansing sponge with or without a cleanser to keep your face clean, and then apply some moisturizer, similarly to putting oil or balm on your beard. Curt Storring is a father and husband who is passionate about helping men achieve greatness. He is the Founder of Liberty Premium Grooming Co., a company that provides bearded men with superior products to ensure they have the confidence and class that comes with looking their best all the time.